About the artist Martina Rall "mARTina"
Martina Rall is a designer, artist, photographer and author. She was born and she currently lives in Tübingen/Germany. She studied Italian and German Literature and Language at the Universities of Tübingen and Parma/Italy (Master of Arts) and Fine Arts at the Academy of Arts in Nürtingen. In the early 90’s she worked as a freelance journalist for the “Riviera Côte d’Azur Zeitung” (The Riviera Times) and since 1994 she is working as a freelance graphic designer. She started doing publicities for German and international companies. Later on she focussed on fine arts and in creating designs for paperproducts, tableware, bedclothes and watches for the national and international market. Since 1998 Martina is a member of the "Alliance of German Designers". 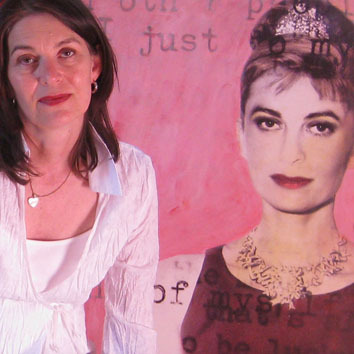 In 2009 Martina started with her mixed media series of self-portraits “Being Marilyn Monroe”, figuring herself as modern day icons like Marilyn Monroe, Frida Kahlo, Audrey Hepburn, Maria Callas, Romy Schneider, Michael Jackson, Grace Kelly and Niki de Saint Phalle. Martina’s passion for portraying creative working people leads from her self-portraits to a second series, the photo portraits of “Artists in Action”. In 2010 she started with the artist portrait of Mirella Leone, a very expressive Italian soprano singer. In 2011 she realized a triptych photocollage of Karl Friedrich, Prince of Hohenzollern, a passionate German jazz musician known as "Charly" and in 2012 she portrayed the German bestselling author Peter Prange. Currently she is working on an artist portrait of the Swiss actor Roland Koch: In 2013 she photographed him in the role of commissioner Matteo Lüthi on film set in Konstanz, during the filming of the popular German crime series "Tatort", in 2014 she portrayed him as a theater director during rehearsals at the Lokremise St. Gallen and in 2015 at the Burgtheater in Vienna, where Koch is part of the ensemble since 1999. Last year Martina portrayed the US American conductor Myron Romanul during orchestra rehearsals in Munich with the Münchner Symphoniker and at the premiere of "All we love about Shakespeare" with the Orchestre Symphonique de Mulhouse in Mulhouse/France.